Your two-hour voyage aboard Boothbay Harbor's largest schooner gives you time to relax and see the Maine coastline. Lighthouses, fishing lobstermen, wildlife, and remote islands accessible only by boat dot the seascape. Herb and Doris Smith sailed around the world twice with their three children on schooners they built by hand. Five of the schooners they built are named Appledore. 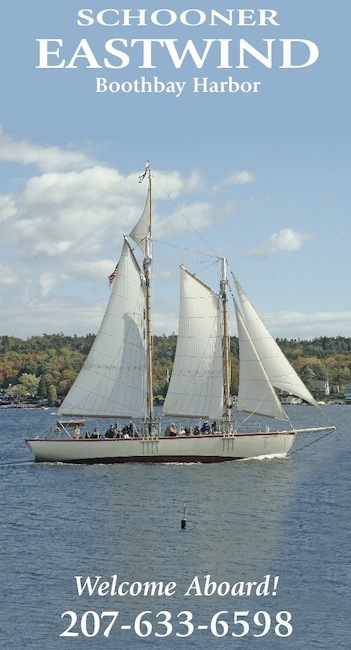 Eastwind, their sixth schooner, is a sistership of Appledore III. They are authors of two books about their world voyages: Sailing Three Oceans and Dreams of Natural Places. Please email for private charters and seasonal variations. Please make reservations at the Eastwind ticket booth located at 20 Commercial Street or call us at 207-633-6598.